"i love Fridays!" this is what i told myself when i got off from work. not because, i'll be out on a gimmick or party with friends but because i'd finally be able to relax after a week of working. not to mention have the chance to sleep for more than 3-4 hrs that i usually get during weekdays. me and my friend Nimfa were on our way home but decided to grab a bite first. we were on our usual chatting mood, and both of us looking forward to spending a stress-free and relaxed weekend when something happened that none of us could have expected. we were on a full stop when we saw a car from the opposite lane coming towards us. when i saw it, i was thinking "where the hell is this car going???" i didn't had the chance to move out of the way since we were stucked: a car in front, a car on my right side, a car behind me and moving cars on my left going the opposite direction. i felt so helpless and 'twas like my heart stopped beating...as the car approaches us, i noticed that there's nobody driving. WTH! i immediately checked on my friend and tried to remove my seatbelt (thank God we always wear seatbelts!) to get out of the car. honestly, my hands were trembling that i literally struggled to get my seatbelts off me. i was choking, almost crying and i can really feel the rush of blood going up my head. then i saw who was driving the other car. apparently, he dropped his phone inside his car and so he ducked his head to look for it...and yeah, he was still stepping on the gas with the steering wheel turned to the left instead of straight! honestly, i wanted to slap him and tell him how stupid he is. he can get us killed just because he dropped his phone inside his car? geesh, i really think he's one of those who shouldn't be allowed to drive. i only had my car for barely 3 months. being a gift from my husband (who was then my boyfriend when he got me this) and knowing how much he sacrificed to get me one, i try to be very careful with it. i may not be a good driver, but definitely i am not one of those who would put somebody else's life in danger while on the road. no matter how tired, or sleepy i am...i focus on my driving all the time to make sure that i am safe and those who are with me in the car as well. yes, i have a comprehensive car insurance...but the inconvenience this stupid accident has brought me can't be covered...also the stress and the trauma this has brought me and to my friend. 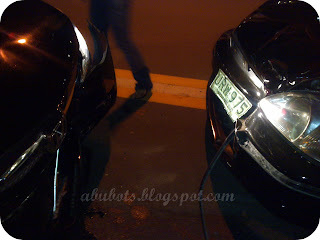 i wonder why there are people who can be so unmindful of others' safety while on the road. they act as if they own the street and so they can do whatever they want, whenever they please. 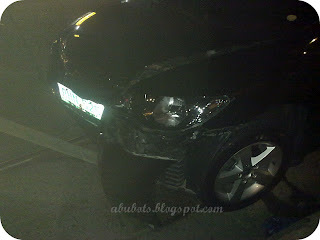 and yes, now i know that being a good driver isn't really enough to be safe on the road. there will be others out there who will just bring you harm just because they left their common sense at home and then went out driving. up to now, the thought of the accident still makes me shiver. what if we died on the crash? what if we were also on the move? that would have caused much more impact. lives could've been wasted just because somebody was too impatient go to a full stop on the side of the street and look for his phone. i hope this would be a reminder to everybody who drives...never, ever use your phone while driving...and most especially do not duck your head and look for something while on the road. it's not only your life you are putting at risk but also others as well. and please, do not leave your common sense and go out driving. thanks for those who have left me messages on my facebook. we are fine...but still shocked. and yeah, my car got really messed up. it won't start anymore so we had to have it towed and be brought somewhere. i almost cried when i saw it being towed last night. i really took care of it, then someone, obviously out of his mind just came out of nowhere and caused a lot of damage. 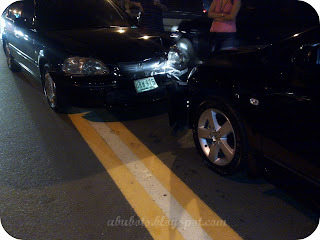 the accident happened past 8pm, and we stayed in the municipal hall until past midnight. good thing my husband's friends came to help us out. i couldn't imagine being alone and not knowing what to do. but of course, what's important is that we are still alive. the car can get fixed/replaced, but i don't think our lives can. Hi sis, there really is no way of recovering from trauma that accidents give you. I've had a lot of near accidents too and this is just a reminder to be more careful while driving. I still wonder why there are some idiots like that on the road. I hope LTO will tighten up its testing. And I hope he will pay for the damage he caused you, even if he can never pay for your time and trauma. I am so glad you are OK!! I was once hit by a Police Dispatcher who ran stop sign because she was late for work! My car waws a write-off...I've been hit by two uninsured drivers, and was hit by a car standing at a cross-walk, because the driver had an epileptic seizure. You can never be too careful! Sheesh. What a stupid way to give someone inconvenience! For a phone that dropped? I would have slapped the guy if I were you. Oh well, what's done is done. Sadly, even if we really take so much care and discipline while driving, there are a lot of bad drivers out there. I've been in minor collisions, too, before. But with inanimate objects like the gutter, islands and parked cars so I'm kinda guilty but on the road, I'm very careful. Just this morning, my rear tire went bust and before I give someone inconvenience, I went to the nearest gas station. Ack. Can't get over the stupid guy! But yes, I'm glad that it didn't give you and your friend any injury at all. Hope you'll be able to recover and well, as I tell myself, every minute on the road is a danger so always be careful :) I hope the hubby is not worrying too much. Omg! Glad you're both safe. Dapat tanggalan ng license yung driver na yun. Pano naareglo sis? Dapat sya nagbayad ng lahat. Glad to hear you & your friend did not get hurt, and that you're safe. Thank you for the reminder. While driving is considered a privilege, this privilege should not be taken for granted, and such privileges come with rules and responsibilities. wow I have heard of male drivers making fun of female drives coz we're 'weak' but this time the male driver has an utterly stupid reason to ruin your car! Yan kasi feeling magaling. omg! his license should be revoked! 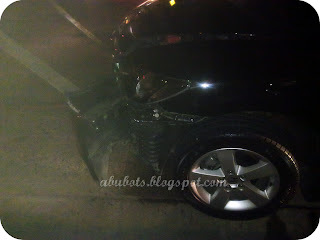 that was very idiotic :/ good thing both you and your friend are safe. OMG grabe! i'm glad you're ok. nakakainis talaga yung mga driver na ganyan hindi nagiisip! I'm so out of synced pa ri talaga.. kasalan ng cafe world at di agad nalaman to.. i'm glad though that all is well. ung number na binigay ko sayo, ok un na lawyer. don't use your money sis. siya dapat maglabas ng pera, demanda mo na lang ng reckless imprudence or whichever na pwede.. basta wag kang maglalabas ng money. 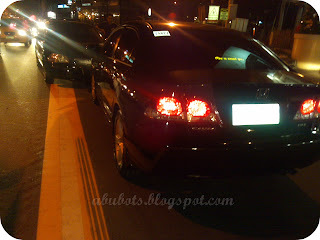 ipablotter na natin yan at iparevoke na natin ang license niya.. guys like him shouldn't be behind the wheels. Terrible. That's why I always drive "defensively" because you never know what might happen in these roads of ours. I hate how we can be so careful and yet others seem to just drive like stupid nuts. Thank God you're fine but don't let him get away with this!